Agriculture & Forestry « Global Market Insights, Inc.
Owing to the rapid adoption of advanced technologies by diverse industrial sectors, the simultaneous localization and mapping (SLAM) technology market has been witnessing gradual increase in demand over the last decade. Unprecedented growth in digital and remote communication technology has accelerated the development of robots and UAVs, which are ideal for installing sensors and mapping systems. The eagerness of core industries to utilize modern technology for replacing human workforce in hazardous or time consuming tasks has further pushed the SLAM technology market penetration. Constant innovations in robotics are providing more opportunities to integrate new systems that help in achieving cost-efficiency across distinct processes, boosting demand for the global SLAM technology market, which registered a valuation of over USD 56 million in 2017. Growing automotive and manufacturing segments have not only deployed collaborative robots that assist in assembling products but also autonomous robots that roam factory floors and have to face a number of human and stationary obstacles during operations. The need for accurately handling objects and moving across the floor has brought the SLAM technology industry into limelight. Various tech firms have cropped up throughout the world, developing more precise mapping solutions to complement existing and new localization systems. These can be incorporated within robots for purposes like surveying and moving objects from one place to another on congested surroundings. Increasingly declining costs of manufacturing robots will certainly boost their presence in several industry verticals, presenting tremendous growth opportunities for the SLAM technology market. The International Data Corporation had projected that by 2021, the spending on robotics worldwide would reach USD 230.7 billion, driven by increased utilization in areas such as manufacturing and resource industries, besides healthcare, education and retail. The resource industry, consisting of mining, oil & gas and agriculture has the potential to become a key target segment for the SLAM technology market. Mining, in particular, offers immense prospects for the use of new technologies as it is a business filled with dangerous exposure for humans, and requires a lot of capital to carry out mining operations. Inaccuracy of underground maps pose serious threats to the safety of miners and robotic exploration is seemingly a more feasible option in regard to this. In the imminent future, integrating simultaneous localization and mapping technology with autonomous mobile robots would be an effective way to build accurate 3D maps of underground mines, helping to plan the overall operations. Aside from mining robots that would replace humans in hazardous environments, companies are also building robots that would work alongside people to assist them in analyzing quality of ore samples, carrying loads and other necessary devices. The SLAM technology industry will consequently experience a prolific growth rate over the next few years, with solutions being developed to automate mining activities. Key factors for the industry propagation would definitely be elimination of safety hazards, reduction in overall costs and time saving. Benefitting from higher commodity prices, the top 40 mining companies globally had recorded earnings of nearly USD 496 billion in 2016, demonstrating the massive scale of mining activities and the potential to improve bottom lines. As old mines get exhausted, these companies are expected to start exploring new mines to keep the mineral supply flowing, indicating the possibility of significant expansion for the SLAM technology market. For instance, the Victoria Gold’s Eagle mine, under development in Canada, would become the biggest mine in the territory of Yukon with production anticipated to at 12.5 million tons per year across a 10-year life span. Further, the USD 2.9 billion South Flank iron ore mine in Australia being constructed by BHP is slated to commence production in 2021 and supply ore until at least 2046. With many such mines being explored to fulfil the global requirement of essential minerals like copper, gold, silver, coal and uranium, the SLAM technology market could establish a strong hold due to the need for safe mapping of underground mines as well as open quarries. Increasing production of consumer electronics has elevated the demand for minerals like silver, strengthening the global mining industry. 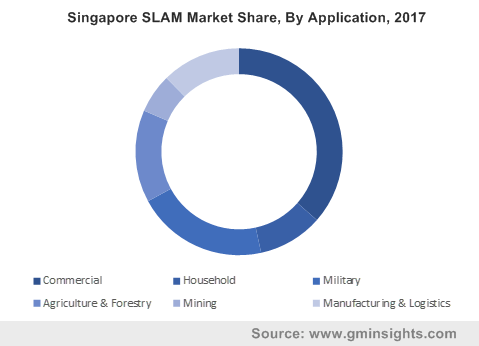 The SLAM technology market is expected to grow at a CAGR of 71% over 2018-2024, influenced by the rising need for mitigating safety risks and improving bottom lines. This entry was posted in Sustainable & Smart Technologies and tagged 2D, 3D, Agriculture & Forestry, Augmented Reality, Autonomous Vehicle, Commercial, Household, Manufacturing & Logistics, Military, MINING, Motion, Robot, Simultaneous Localization and Mapping Technology Market, SLAM Technology Market, UAV.